This article is part of an ongoing series of shared content through our partnership with Architizer, a marketplace, resource, and community that connects architects to their peers, fans, and potential clients. Concrete is a material loved by architects for its innate solidity, strength, and resilience. However, before it is cast, its liquefied state possesses entirely different traits that raise wonderful possibilities for designers: it will echo the inner surface texture of any formwork it is poured into, thus providing architects with an endless choice of finishes that can help define the core character of a building. In Phaidon’s book Concrete, a veritable treasure trove of projects illustrates the wide variety of surface finishes that can be achieved with this captivating material, the “liquid stone” of the architectural realm. Here, we highlight seven ways to add texture to your concrete exteriors, using projects from across the globe as examples. Each of these finishes offers up a fresh way to showcase this ubiquitous material in all its rough, raw glory. Planning permission for this barn in the Swiss municipality of Scharans was granted with the condition that the new building would have an identical volume to the structure it replaced. The architects utilized heavily textured concrete, to lend the new barn a contemporary aesthetic, overlaid with a series of wheel motifs that help break up the building’s monolithic form. Red iron oxide was added to the concrete and lends the façades a rusty umber hue. Zumthor’s understated icon in rural Germany is characterized by an interior of 112 charred tree trunks encased within 24 layers of rough, tan-colored concrete. The external surfaces are left raw and exposed — lending the building a somber, humble appearance that reflects its use as a place of quiet reflection. Large, rocky aggregate and tonal variations between each layer of concrete forms elevations that evoke cliffs of sedimentary rock. The rough-hewn walls inside this architectural curio on Spain’s “Coast of Death” are the results of a highly unusual construction process. Concrete was poured into a formwork of hay bales, which were, then, eaten away by a cow — yes, a cow — leaving a hollowed-out shell behind. The cave-like interior was then fitted out with a bed, bathroom, and picture window, which offers guests an unconventional retreat with an unhindered view of the Atlantic Ocean. This Swiss water storage facility is an architectural iceberg, with only one floor visible above the ground and vast spaces below. Perforated, precast concrete panels wrap the entrance to the reservoir and allow plants and flowers to grow up through the holes over time and merge the building with its parkland context. Embedded within the terrain, the building takes on the appearance of a mysterious sculpture rather than a utilitarian structure. The concrete surfaces of this sports center in Aargau are relatively smooth compared to the aforementioned projects, but every slight variation in texture is amplified by light as it streams across a striking, concertinaed elevation. 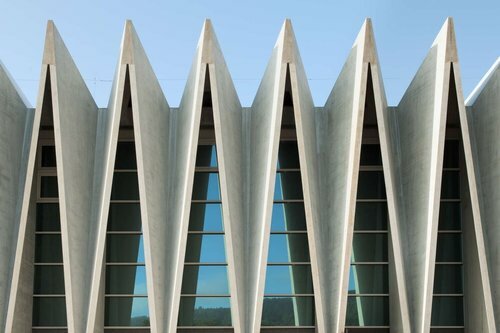 The folded façade forms slender triangular openings that allow daylight to stream through floor-to-ceiling glazing concealed behind the concrete — creating ideal conditions for the basketball court within. Soft, sweeping curves of concrete appear to have been carved into the exterior of the Sun Moon Lake Administration Office, which evokes the stunning natural landforms of the surrounding landscape. A formwork of rough timber planks was utilized to create these canyon-like walls — leaving the impression of wood grain on every surface. This textured concrete finish extends across the threshold to form ceilings inside the building and merge interior and exterior spaces. The solid sections of each elevation on this social housing project in the Spanish capital are broken up with an ingenious system of precast concrete panels. Each tapered panel was cast in a textured mold the result of which captures the glaring southern sun to form a play of ever-changing light and shadow and ensure that these buildings appear dynamic, adapting and reacting to their context. THIS ARTICLE ORIGINALLY APPEARED ON ARCHITIZER HERE.